It's been a good while since one of these has appeared on A Yellow Brick Blog - mainly because I have been saving my money/have no money. BUT I have cheeky little one to share with you all today and most of this stuff I purchased with my Boots advantage card points and more or less all of them were total bargains (my fav!) - I think only 1 item cost me more than £3 - so all is good! Newbies out on he shelves of the UK, I have been eyeing these up since the day they were released. Mainly because of the scents - I am obsessed with just smelling everything when mooching round Boots, does anyone else do this? I saw the larger bottles of these were half price so only £1.94 each so of course picked up this duo - with coconut oil and cocoa butter surely this can't be bad! This was £1.75..... yes I kid you not! Under £2 for a full-sized John Frieda overnight treatment - hell yes. Love a good clearance bargain and I got a few in this trip! I'm looking forward to trying this out especially with the weather getting a little warmer - more frizz is bound to try and creep it's way into my life and I'm just not having it! 50p!!!! Fifty British piece for this mini treatment tube! What a steal! I'm going to save this for before a big night out when I want straight glossy soft locks! Now this was actually quite a random purchase - I had to get my boyfriend's hair stuff which is by VO5 and I noticed their styling products were 2 for £5! His stuff was about £3.20 ... so clearly I had to get myself something if it was just going to cost me an extra £1.80! This is what I found - it looks fab and is £6.29 on its own so to get this along with the boyf's hair wax for just £5 - bargain city! Really looking forward to trying this out! Bought it. Tried it. LOVE it. This made my hair feel amazing - I could run my fingers through my hair straight after the shower - whereas normally I'm there with my moroccanoil and tangle teezer trying to get rid of all the knots and craziness! It was half price at £2.54 and think I may invest in another to keep me going! After recently trying out the face mask from this brand I set out on a mission to find another product to try! This like the mask was only 99p on offer and after reading so many rave reviews I couldn't resist! Bring on de-puffed eyes and hopefully smaller bags! This stuff is a god send and lasts for months and months - I swear the last one I bought was last summer and I haven't even finished it yet! Saying that it is near the end and this had about 1/3 off and had a cute limited edition packaging so grabbed it while I could! This is a lovely moisturiser I use for more or less anything and I love the smell of Nivea products! This sachet was only 66p so thought I would grab it for the night time I decide to give myself a bit of a pampering. I love the smell of coconut and heard this works so well at hydrating the skin so can't wait to give it a whirl! Can't live without these badboys. I don't know how anyone can use small thin cotton pads - I have to have these thick huge double sided ones! I use these mainly for my Liz Earle Skin Tonic which I use twice a day - my routine is incomplete without it! This are also great for removing nail polish - just one pad can do nearly all my fingers! This is a product I have been eyeing up for months and months and months - ever since they were announced really! I have seen so many people wearing it, talking about it, blogging about it and so when I spotted it the other day I knew it was about time I bought it (and it was with my Boots points so didn't feel like I was splashing out on an unnecessary item!) This colour is gorgeous and I love the finish of these lip crayons - I can tell this is going to be one of my most worn of Spring/Summer this year and I am now itching to buy the rest of the collection! My addiction to buying lip balms seems to be never ending! This was also a clearance item so for only £1.85 I couldn't just walk past without adding it to my basket of goodies! This smell so yummy and is a great lip balm! Burt's Bees are a brand I really want to try more of so if you have any recommendations let me know! 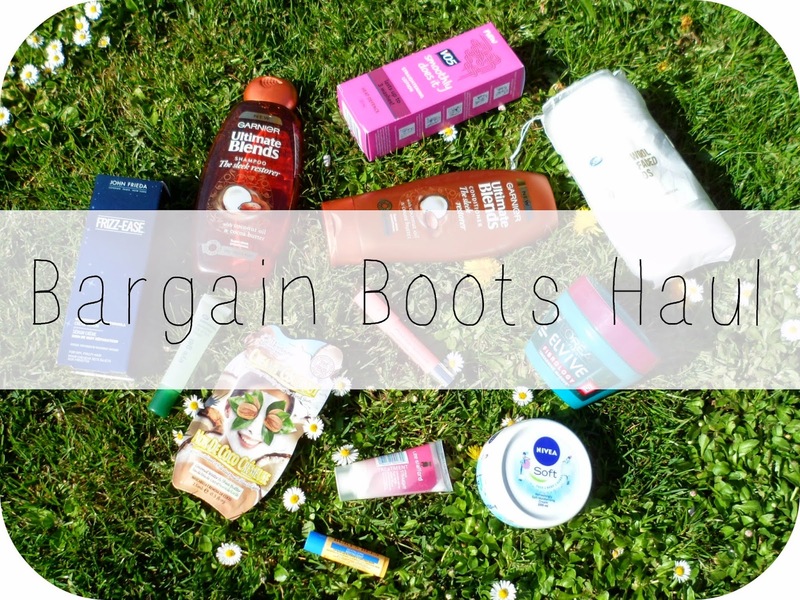 So there we have it - a little Boots haul for you all! Any products in there that you own/have tried? Have you bought anything from Boots lately? I haven't tried the coconut mask but I often keep multiple packets of the chocolate mask from the same brand and it works really well! Not as well as say, Origins products, but for the price, it's definitely a great mask! I hate that lip balm, it just is not my jam..I much prefer the mango one! I just bought the garnier blends too! Love it, already made a difference to my hair!